Logically, black and white monochrome isn't the most obvious pairing for a children’s room, but within a sea of colourful characters, it makes for a refreshing change and allows playful prints and lovely layering to unite! Monochrome schemes create distinctive, clean and modern looking rooms, but by keeping walls white or grey, you can really have fun with prints and accessories in the space to add personality and pizazz. Is all that black and white a little too subtle for your liking? Why not add pops of colour for extra oomph! In terms of shape, geometrics are right at home with graphical black & white styling, and if you'd like their own room to stand out from the swathes of trendy monochromatic spaces, then why not create some bespoke wall art? 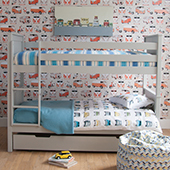 For the Simple bunk bed photo shoot, we added character to bare grey walls by painting on charcoal triangles. Hand painting them gives a more effortless irregularity, but if you’re not too confident with a paintbrush, try black vinyl or even card to recreate the look. 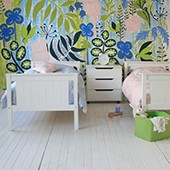 Simple Geometric designs work so well in kids’ rooms and provide an educational environment too! Other shapes that also look right at home with this theme are giant noughts and crosses, clusters of stars, and cute oversized polka dots! The key to this look is to randomise the designs across the wall, so mix up the scales and try not to follow a repeat pattern. If the ever-trendy mountain-scape is more your thing and your little one is a determined little explorer, then you’ll need a pencil, a rule and some masking tape, pronto! Using the rule and pencil, carefully draw on the shape of your mountains, taking care to plan in where you might want wall art to be located. Also consider the height of their bed. - No good painting a mountain if the peaks are barely going to show over the top! Uneven peaks look more natural and authentic than ensuring that all of your angles are matching, so throw out the protractor for this one! The next step is to mask off to the drawn line, and then paint away till the desired effect is achieved. Top Tip: Use the most expensive masking tape that you can get your hands on - Totally worth the extra £s! 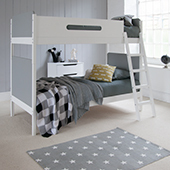 When it comes to the all-important sleep station, there are SO many beds to choose from at Little Folks that would work with this Scandi vibe. Does your little one have a monochrome room? If so, we'd love to see it. – Drop Little Folks Furniture an email with pictures of their Monochromatic space!